What is Blue Buffalo Healthy Growth Dry Kitten Food? Featuring a delicious blend of chicken, brown rice, and other nutrition-packed ingredients, this dry cat food will support your growing pet. 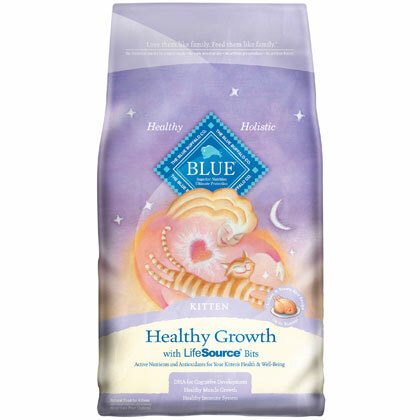 Blue Buffalo Healthy Growth Dry Kitten Food targets many important developmental needs, including healthy eyes and a strong heart. With flavorful chicken as the main ingredient, Blue Buffalo Healthy Growth Dry Kitten Food boasts the protein and amino acids that every active little kitten needs during a busy day. In addition, Blue Buffalo Healthy Growth Dry Kitten Food encourages your pet to eat her veggies, by including nourishing and delicious sweet potatoes, carrots, and more in each bite. Serve your kitten Blue Buffalo Healthy Growth Dry Kitten Food around three or four times each day, to keep up with her high energy levels and rapid growth. Young kittens may have trouble eating dry food. To address this concern, mix warm water in with the food to create a softer, more flavorful meal for your young kitten. Place a clean, dry, kitten-friendly dish on the floor. Ensure that your kitten can comfortably reach the dish. Scoop a portion of dry cat food into the bowl. Let your kitten eat freely. When your pet no longer shows interest in the food, clean the dish and surrounding area and store the bag of Blue Buffalo Healthy Growth Dry Kitten Food. Alternatively, leave a bowl of food out for your kitten at all times, refreshing the food when necessary. Include a bowl of cool, fresh water every time you serve your kitten a meal. This helps ensure that your pet maintains proper hydration, for optimal health. Ingredients: Deboned Chicken, Chicken Meal, Whole Ground Brown Rice, Whole Ground Barley, Oatmeal, Chicken Fat (preserved with Mixed Tocopherols), Salmon Meal, Menhaden Fish Meal (source of DHA-Docosahexaenoic Acid), Natural Chicken Flavor, Whole Potatoes, Peas, Dried Egg, Whole Carrots, Whole Sweet Potatoes, Cranberries, Blueberries, Flaxseed (source of Omega 3 and 6 Fatty Acids), Barley Grass, Dried Parsley, Alfalfa Meal, Dried Kelp, Taurine, Yucca Schidigera Extract, L-Carnitine, L-Lysine, Turmeric, Fish Oil (source of Omega 3 Fatty Acids), Oil of Rosemary, Beta Carotene, Vitamin A Supplement, Thiamine Mononitrate (Vitamin B1), Riboflavin (Vitamin B2), Niacin (Vitamin B3), d-Calcium Pantothenate (Vitamin B5), Pyridoxine Hydrochloride (Vitamin B6), Biotin (Vitamin B7), Folic Acid (Vitamin B9), Vitamin B12 Supplement, Calcium Ascorbate (source of Vitamin C), Vitamin D3 Supplement, Vitamin E Supplement, Iron Amino Acid Chelate, Zinc Amino Acid Chelate, Manganese Amino Acid Chelate, Copper Amino Acid Chelate, Choline Chloride, Sodium Selenite, Calcium Iodate, Salt, Caramel, Potassium Chloride, Dried Yeast (source of Saccharomyces cerevisiae), Dried Lactobacillus acidophilus fermentation product, Dried Bacillus subtilis fermentation product, Dried Enterococcus faecium fermentation product. Nutrition Statement:BLUE Healthy Growth for Kittens is formulated to meet the nutritional levels established by the AAFCO Cat Food Nutrient Profiles for growth. Keep the bag closed to avoid losing freshness and flavor. Make sure your kitten and other household pets cannot easily access the bag of dry cat food.